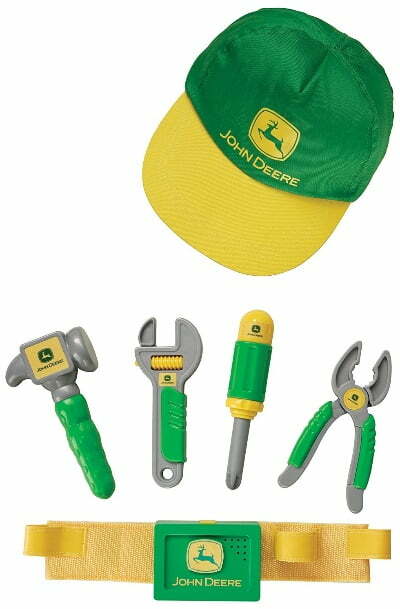 John Deere is one of the most popular and recognized brands in the agricultural industry. 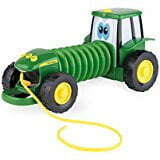 Their farm-themed toy collection makes use of sounds, lights, music, shape and functions to look as realistic as possible. Children can now have the same equipment as Dad and Mom and help out with the chores while learning and getting entertained. The versatile and innovative toys come with a lot of interactive and creative features which keep the children busy with hours of fun. They can play pretend farmers, mechanics, riders and drivers. They also learn about farm animals and the sounds they make, play farm songs, ride tractors, and give a helping hand to their parents by working alongside Dad and Mom in their cute and colorful toys. The toys cater for children of all ages and they are made of durable plastic that will see your child throughout their development stages. The toys are affordable and you are assured of getting one that suits your budget as well as your little one’s needs. Below we have listed some of the most popular John Deere toys in 2016 as well as their estimated costs. You can grab any of the following toys and share the joy with a child this festive season. 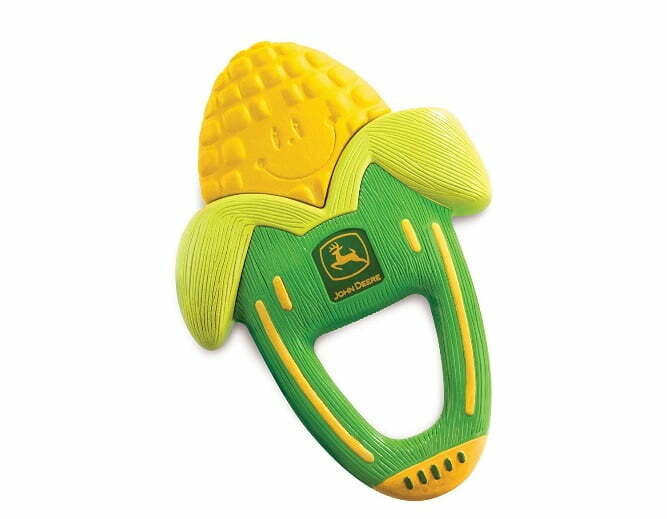 The Corn Teether is the perfect tot toy for teething toddlers. The BPA free corn kernel has a soft, rubbery texture and gentle vibrations which are activated when the baby gnaws on it. 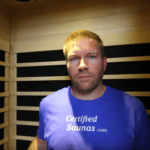 The massage sensation soothes the gums and provides relief from teething pain. This is also a great way to teach the little one cause and effect. The toy has a long-life battery that is sealed inside and the corn-shaped handle is easy to grip by the little biter. It is designed for babies who are at least 6 months old. 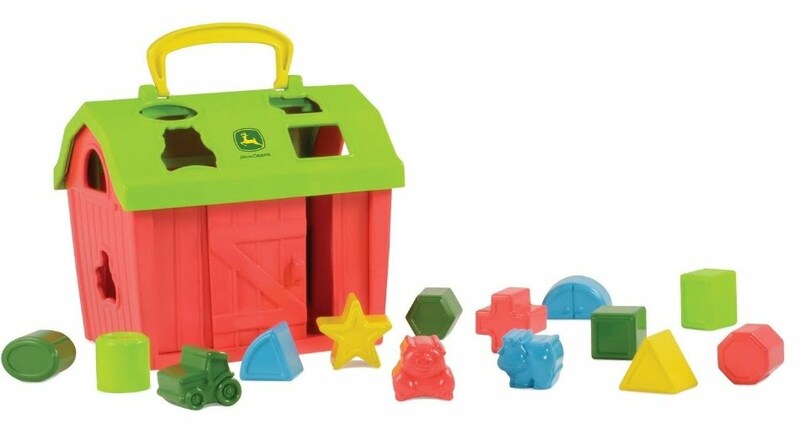 The John Deere Barnyard Shape Sorter is a fun way for your little one to learn about colors, shapes, and counting. The set features cows, pigs and tractors in 14 different shapes which are supposed to be sorted out. This teaches shapes and animal recognition as well as encourages hand and eye coordination and matching skills. The sliding barn door makes the shapes easily accessible. The front slides open to release the shapes for sorting. The roof top handle makes it easy for the child to carry the Shape Sorter around. The animals come in a variety of fun and brightly-coloured shapes. The sorting of shapes and the opening and closing of the barn door teaches kids motor skills. 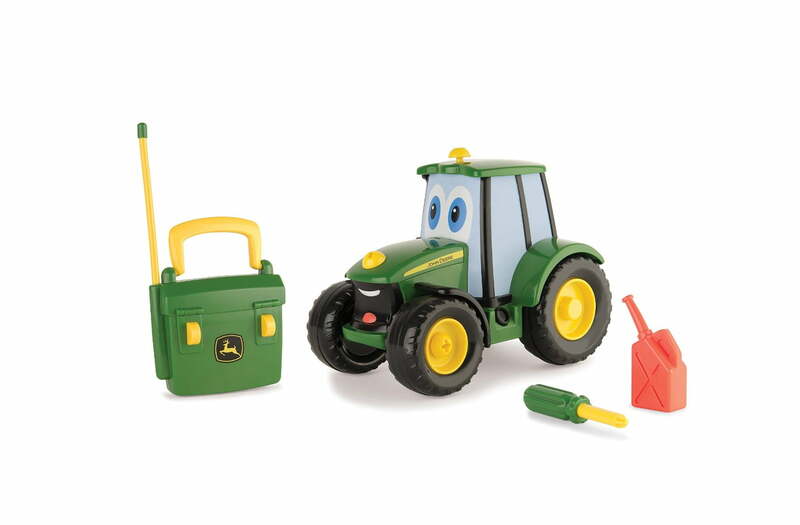 The John Deere Barnyard Shape Sorter is ideal for children who are 18 months and above. This fanciful accordion-playing tractor has a set that encourages kids to explore their musical creativity through its six musical instruments; xylophone, horn, drums, rasp and two maracas. The pull-along musical tractor plays fun, farm tunes. Pressing the yellow buttons on top of the hood while you squeeze changes the musical notes. 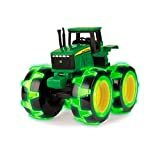 The tractor is made from durable plastic and it requires no batteries. It is recommended for children above one year. 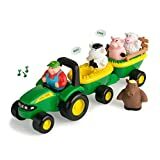 The farm-themed toy with musical creativity will provide your child with hours of entertainment and inspire the little ones to learn farm animals as well as the sounds the animals make. It has a lot of interactive activities which include lively music, classic farm songs such as “Farmer in the Dell”, tractor sounds and quiz games. 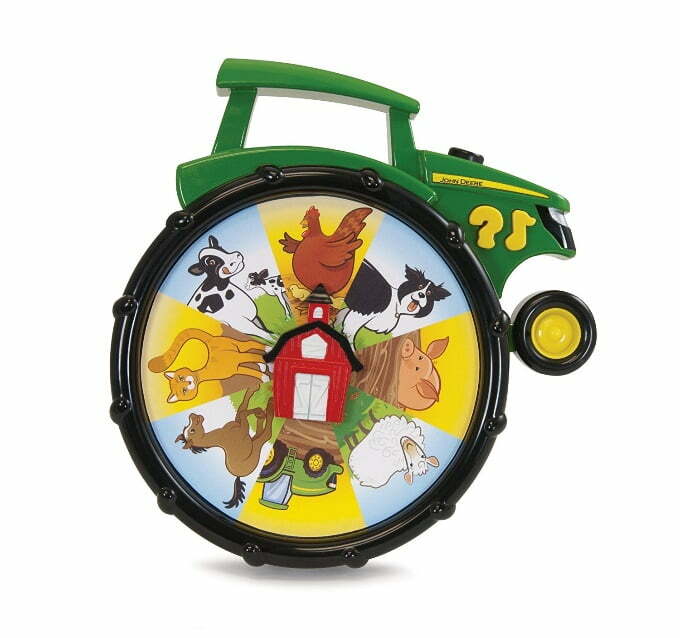 The fun toy features an over-sized farm tractor wheel with illustrations of 6 popular farm animals and a friendly tractor. The child can spin the barn randomly by pulling down on the front wheel, or they can point the barn to either of the farm animals, or vehicles then spin to learn. When the barn points at a specific animal, the sound made by that animal is played. The cab roof creates carry handle. The toy can be in music mode, or quiz mode. It operates on 3 AA Batteries, and is recommended for toddlers aged 18 months and above. 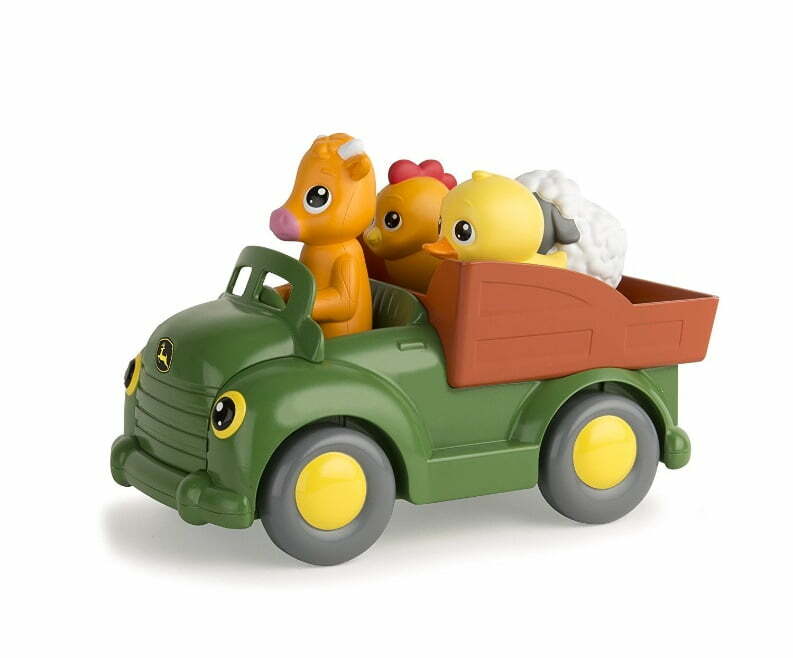 This popping toy that is filled with delightful animal sound effects is made up of a truck and 3 farm animals; a duck, sheep and chicken which are placed in slots at the back of the truck. The three animals come in the shape of a triangle, a square and a circle respectively. When you press on the cow behind the wheel, the truck starts rolling and music starts to play encouraging your toddler to toddle after it. 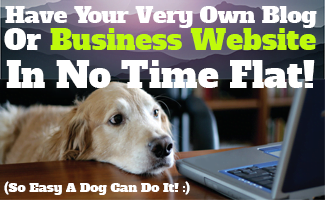 When the truck stops, the animals pop up and go flying out. The little hands get an early training on identifying and sorting shapes by matching the shapes with their correct, respective slots. They also learn sounds made by various farm animals, colours and music. The tipper features a shape-sorting tray that makes animal noises when you match the shapes to their correct slots. It offers children an exciting way of developing motor skills, matching skills, creative imagination and cause-effect learning by inspiring discovery and exploration by toddlers. It is powered by 3 AA batteries. 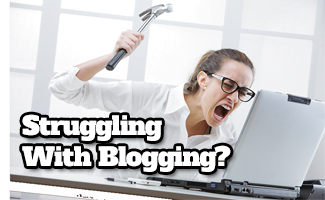 The truck can also be pushed manually. It is recommended for age 1 – 2 years. This talking toolbelt will be an ideal gift for your tiny mechanic. This set is made up of 7 pieces; a hammer, wrench, screwdriver, pliers, an adjustable hat, a tool belt and a tool buckle. The adjustable belt has a slot for each tool and an electronic belt buckle which has 2 John Deere phrases and 3 tool sounds. Your baby can now buckle up and lend a helping hand in fixing his toys with this fun tool set. The belt is powered by 3 AA batteries and it is designed for children with a minimum age of 2 years. The realistic lights, sounds and music of the John Deere Busy Driver will delight your budding farmer by revving up their fun. 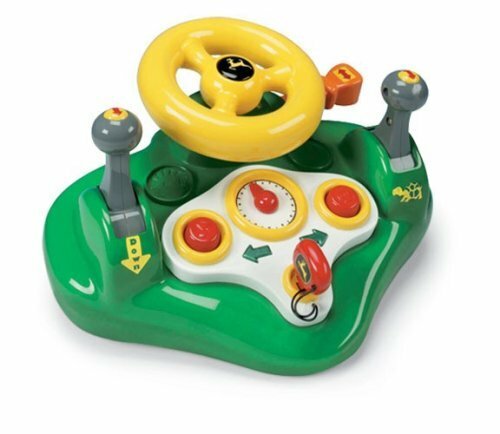 This action-loaded toy features a key, a wheel, buttons, turning signals, and two levers. The horn, turn signal, and engine have at least 8 authentic tractor sounds, a lively tune and flashing blinkers that will give your child a realistic driving experience. The radio, horn and hazard sounds are activated by interactive knobs and levers that are easy to operate. This tractor is filled with interactive and fun activities that will keep the little drivers busy. 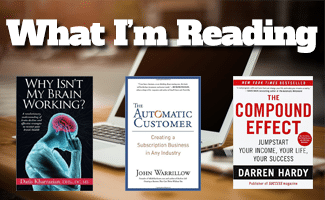 They will be thrilled to hear the revving up of the engine, the honking of the horn, the beeping when they back up, and the clicking of their turn signals, which also blink and start flashing. 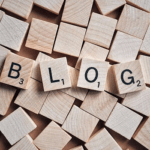 Start the engine by turning the tethered key. 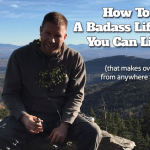 When you pull the throttle, the engine revs up and the Busy Driver starts playing the lively “Jimmy Crack Corn”. To hear hydraulic sounds, push down on the opposite lever. Shift gears by pushing up, or pulling down the left lever. 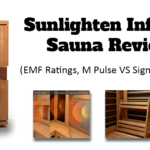 Every button, knob, and switch has some type of light or sound action associated with it. The bright-coloured steering wheel, durable plastic and dual stick shifts will set off children on a real adventure and help them develop imagination and motoring skills, as well as introduce them to sounds. The imaginative toy is powered by 3 AA batteries. It is suitable for children in the age range of 18 months to 5 years. Get ready for your children’s fun exploits in the sun and sand by scooping this 4-piece Sand Box for them. 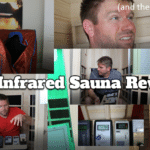 It is an ideal toy for outdoor adventures in the beach, parks, and even your own backyard. The toy includes sand tools such as a hand tiller, a scoop with a sifter and a tractor wheel pattern roller. 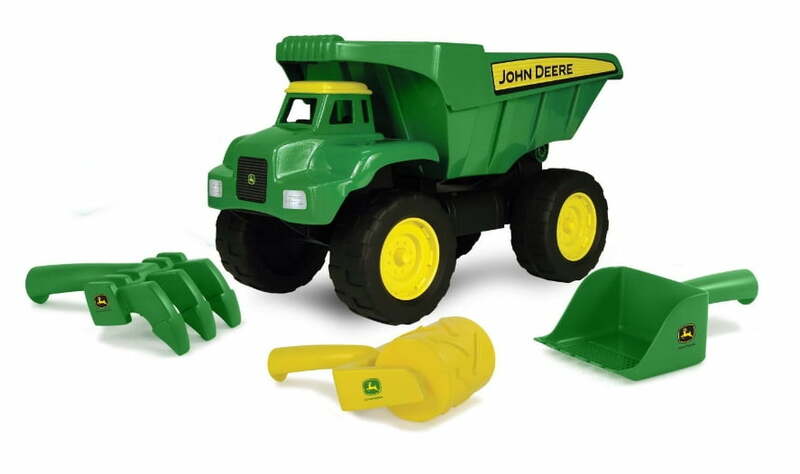 The big scoop dump truck, which comes in John Deere signature green and yellow colours, has a handle that the little dirt diggers will find easy to grip and tip loads out of the dump bed. It is recommended for children who are at least 3 years old. Make your barnyard adventure even more exciting by hopping on the John Deere Animal Sounds HayRide and pulling your favourite farm animals along. 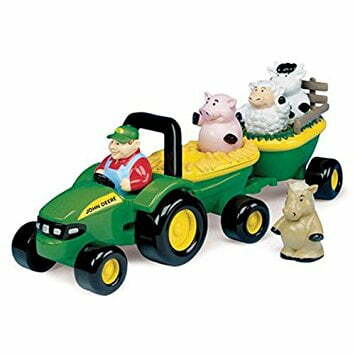 This classic set constitutes of 6 pieces: a push-along tractor with attached wagons, a farmer, and four farm animals. With animal sounds, music and removable animals, this fun toy is great for learning sounds, animal recognition and matching skills. The cow, pig, sheep, and horse can be removed from their seats. To put them back, you must match the farm animals to their correct seats in the wagon. To hear them make realistic sounds, push down on them in their seats. This toy teaches children to match the animals with their right spots by picture and sound. By doing this, they are able to learn about various farm animals and the sounds that they make. Press on the farmer to hear him sing ‘Old McDonald’. You can add the animal sounds into the song by pushing down on the animals while the song plays. 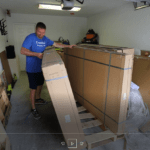 The wagons are attached so the children cannot pull them apart. The HayRide is operated by 3 “AAA” batteries. Age grade: 18mos.+. Recommended age: 16 Months to 12 Years. The built-in bells, drum and squeaker of the push along toy combine harvester truck easily tell you that this is not your average, run-of-the-mill tractor toy. The John Deere Musical Corey Combine consists of six musical keys, with each individual tune playing a different note, which offers an interactive and creative, musical way for your toddler to learn. The little farmers will be delighted to have a concert as they go about harvesting their crops. The harvester is entirely powered by the toddler and it requires no batteries. Kids can plug the 12-inch long handlebar into the back of the tractor so they can push it along as they walk. The corn heads click to play beautiful, ringing notes as the front wheels roll. You can get a drumming sound by tapping on the clear-screen top. For ratchet noise, pivot the exhaust pipe. For a squeak, press the button on top of Corey’s head. In addition to sparking musical creativity, the combine harvester comes with a music booklet of 4 popular songs that kids can learn to play: ‘Twinkle, Twinkle Little Star’, ‘Old McDonald Had a Farm’, ‘Ring Around the Rosie’ and, ‘Mary Had a Little Lamb’. 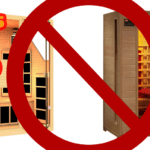 It is recommended for children who are at least 18 months old. 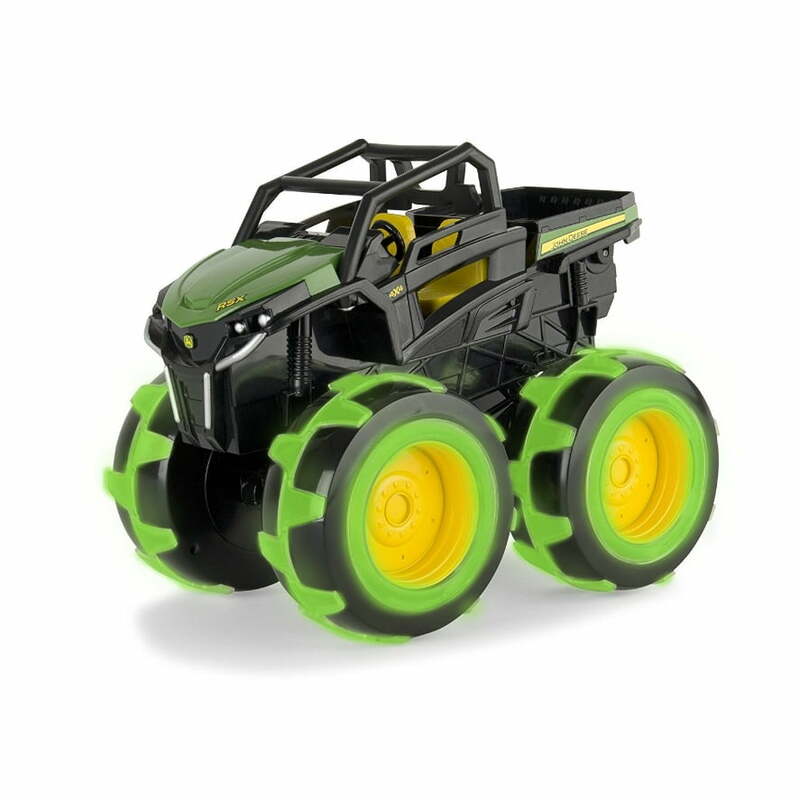 The monster style and tough exterior of the John Deere Monster Treads Lighting Wheels Gator vehicle will ensure that this innovative toy lasts throughout your child’s developmental stages. Its durability will withstand the rough childhood play that is associated with off-road adventures. Its coolest feature is the four super cool oversized wheels that light up when the Gator vehicle is in motion. The glowing, green LED lights are activated by rolling the vehicle either forwards, or backwards. This relatively monstrous-sized toy will clear everything that lies in its path and is perfect for both indoors and outdoors. 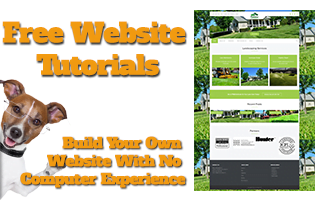 The Gator vehicle has no sound, which means that your child can come up with creative sounds. This promotes imagination and speech development. It is powered by 3 AAA batteries and is ideal for children who are at least 3 years old. 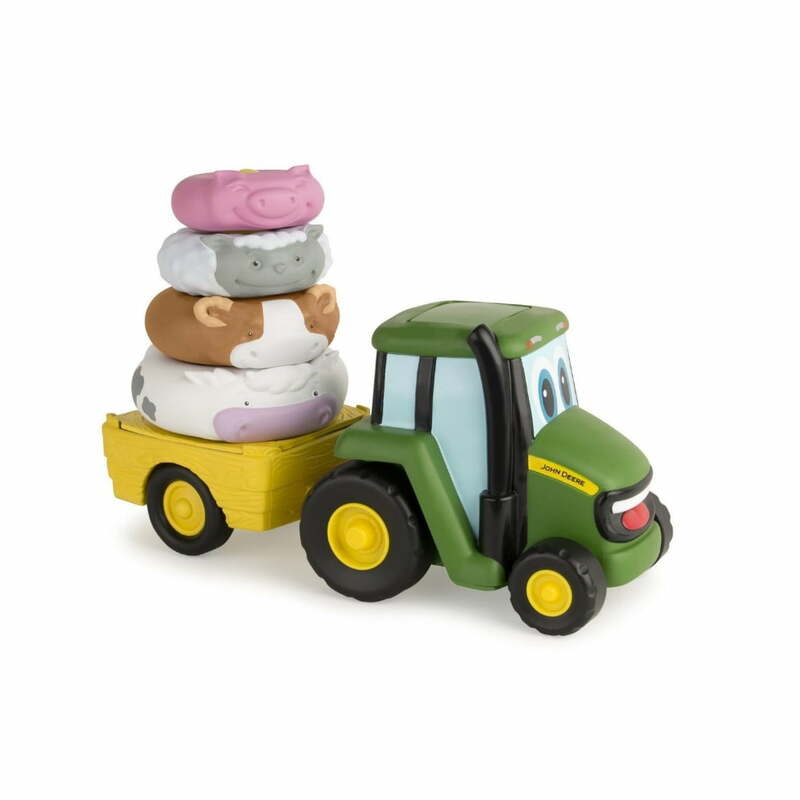 Stacked with cute, doughnut-shaped farm animals, expressive eyes, and a bright smile, this cute and squishy tractor will delight the little ones. The four rings twirl on the tower when you the tractor is in motion and “Farmer in the Dell” plays when you press down on the easily activated button the cab. The rings feature a pig, ram, cow and a sheep, which make animal noises when you stack the rings onto the wagon in their respective order. Each animal is round with a hole in the middle that can be stacked like a doughnut. An animal jumps into the wagon whenever the tractor stops. The tractor also has an attached hay wagon. The John Deere Farm Stacker not only teaches the little hands driving and stacking skills, but it also teaches them the sounds made by animals. It also improves their hand-eye coordination and encourages imagination. It is powered by 2 AA batteries. This toy is recommended for kids aged between 18 months and 3 years. The little ones can now help out with the outdoor chores and have fun while at it. 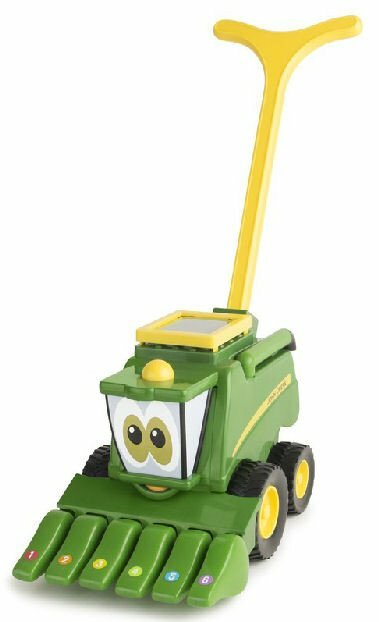 This John Deere Electronic Lawn Mower is loaded with interactive features that will entertain them and encourage imaginative role play. It has realistic running mower sounds and a voice prompt that reminds your child to check gas and oil. Each button on the mower has a different, unique sound. The rotating grass clippings and spinning grass blade are entertaining to watch, and there is even fake grass in a container at the back of the mower that makes it look like the child actually cut grass. 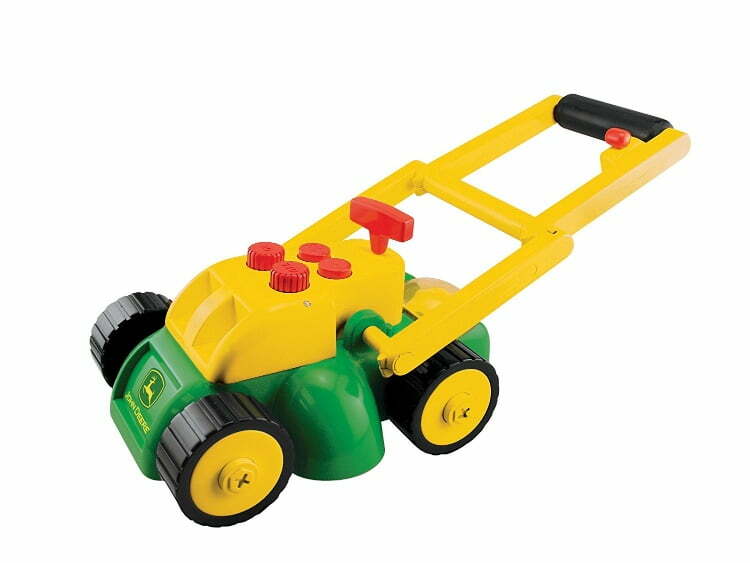 The mower is made of durable and safe plastic and its extendable handle can be easily adjusted to save up on storage space. It is powered by 3 AA batteries, and is recommended for children aged above 2 years. 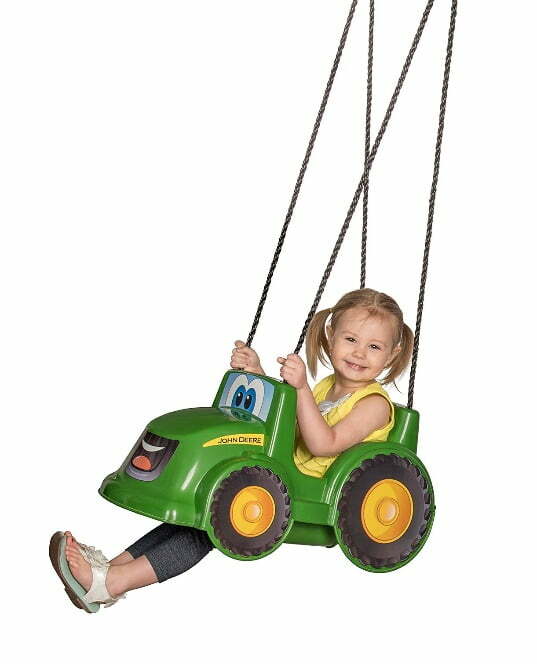 Introduce your toddler to outdoors fun with this safe push swing that features a safety t-bar with leg openings, a full bucket seat, a waist strap that can be adjusted, a high seat back, tough and sturdy plastic construction, weather-resistant rope, and a weight limit of 50 lbs. The swing is fully assembled and ready for your yard, tree, or playground. The safety features give additional protection to your little rider. It is recommended for toddlers aged between 9-36 months. 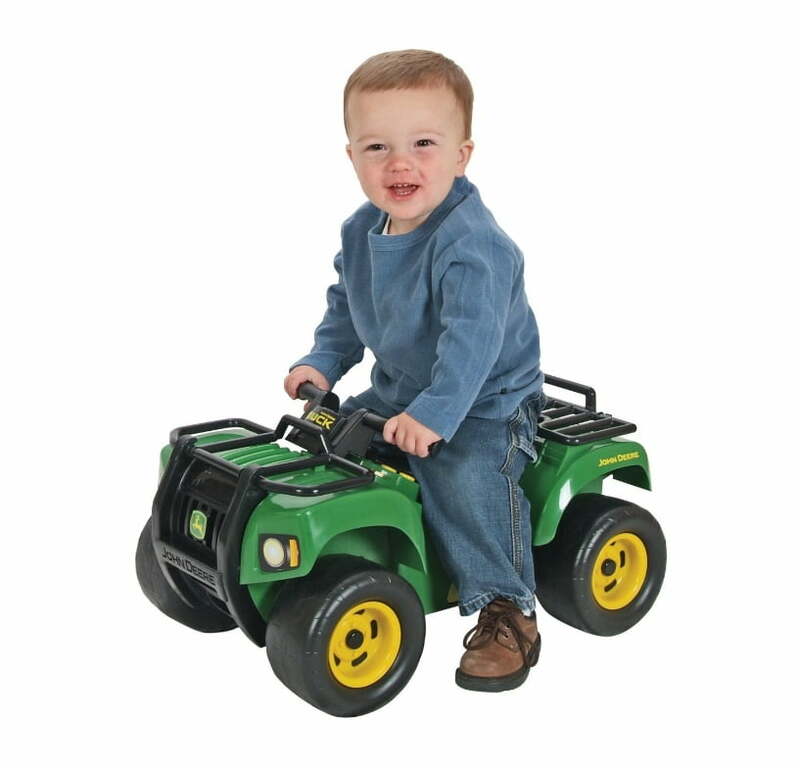 This John Deere Buck Light and Sound all-terrain vehicle is bound to give your toddler a realistic riding adventure. With its blinking signals that make it more authentic, fun sound effects, wide tires, tough plastic exterior and a lot of cool features, this will easily become your child’s favourite riding toy. It features four push buttons with blinking lights and sound and an engine revving sound which is activated by the key. The rear racks swivel up and down to encourage curiosity. The child’s scooting motion is what powers the John Deere Buck Sit-N-Scoot ride on all-terrain vehicle whose maximum weight limit is 50 pounds. It also features carry racks which swing up and down to entice the little one to explore. It is recommended for children aged 12 months to 5 years. Both parents and kids will love the John Deere Sit N Scoot Activity Tractor not only because of its fun features, but also for its educational ability. This toy uses four cute animals to teach your little ones about farm sounds. The pig, horse, sheep, and cow in the flip out playset area which make sound when placed in their slot encourage imaginative play and the removable walk behind bar is a fantastic walking aid for toddlers. You can press the horn to hear the “Old McDonald” tune. The three-in-one design allows toddlers to scoot along, push along, or be pushed along. 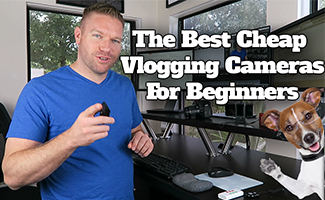 It will be a great companion for your little ones as they go through the many stages of development. This cruising toy features a back rest which prevents the toddlers from tumbling over backwards as they ride along. Parents who do not like loud toys will also be pleased to learn that the volume of the John Deere Sit N Scoot Activity Tractor can be adjusted to Normal, Low and even Off. Recommended age: 12 months to 5 years. The versatile John Deere Farm Wagon will help your child improve their loading and hauling capability. The Farm Wagon includes a detachable pull handle which makes it perfect as a standalone wagon as well as a wagon that can be attached to any John Deere children’s riding vehicle that has a hitch. The little ones can load and remove their haul from the wagon effortlessly using a convenient end gate opening. With a weight capacity of 66 lbs, the spacious Farm Wagon can transport the heaviest sand, dirt, twigs, rocks, toys and anything else that their little hearts might desire. It also has a locking hitch pin. It is recommended for children aged 3 to 7 years. The tractor-style tricycle which features a three-wheel configuration, handlebars, and pedals like a traditional trike is a great tot toy for outdoor fun. The kids can learn how to pedal and even race on it. It can hold a maximum weight limit of 60 lbs. 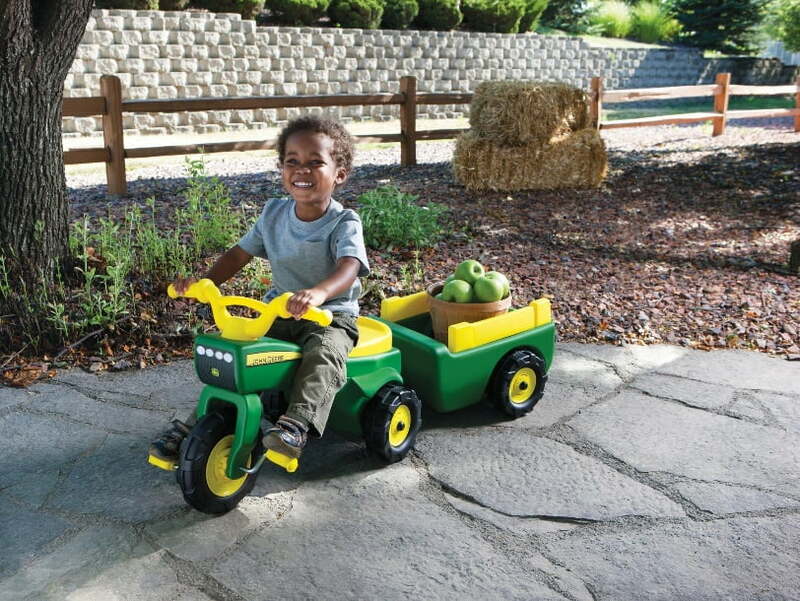 This John Deere trike has a detachable two-wheel, pull-along wagon that is spacious enough to hold anything that the little hands haul on it, from their favourite toys and fruits to dirt meant for the compost bin. The pedals are located on the front wheel and the handlebars are used for steering. The turf tread tires provide traction on surfaces and the tough plastic makes the trike durable. It is designed for children aged 18 months to 4 years. 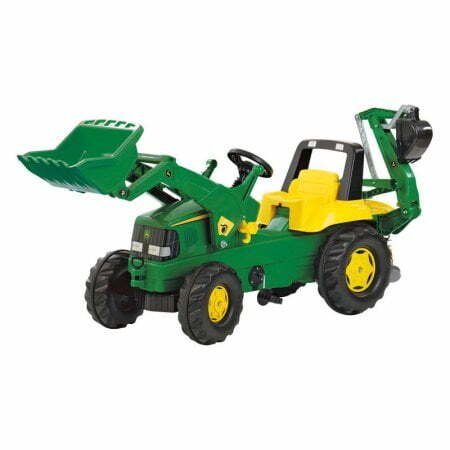 Your little one will get great exercise and derive a lot of fun from the John Deere Backhoe Loader Tractor Ride-On, but it will also stir the child’s imagination. The oversized tyres with rubberized treads provide traction and the smooth resin body and covered fixed wheel chain drive gives it a realistic tractor look that is both stylish and durable. It has pedal crank with eccentric bearings and front and rear hitches which allow for addition of accessories. 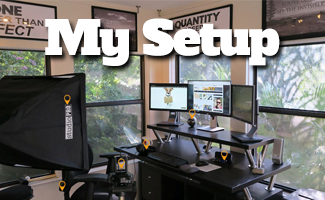 The accessories can be bought separately. The backhoe and front loader are fully-functional. 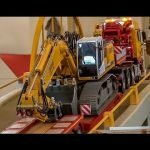 They can raise, lower, scoop and tip with levers that are easy to operate. 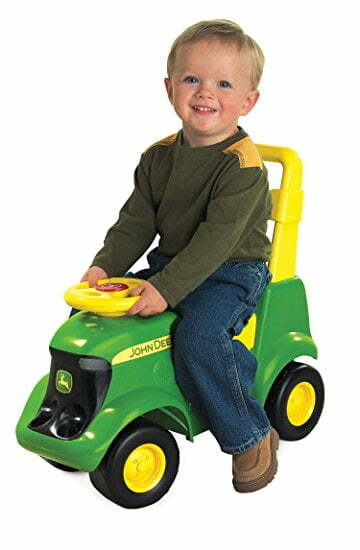 This pedal driven tractor also includes an adjustable seat. It has a front axle with suspension and 12 mm rear axle. The anti-slip pedals ensure that your child is equipped enough to take care of business.